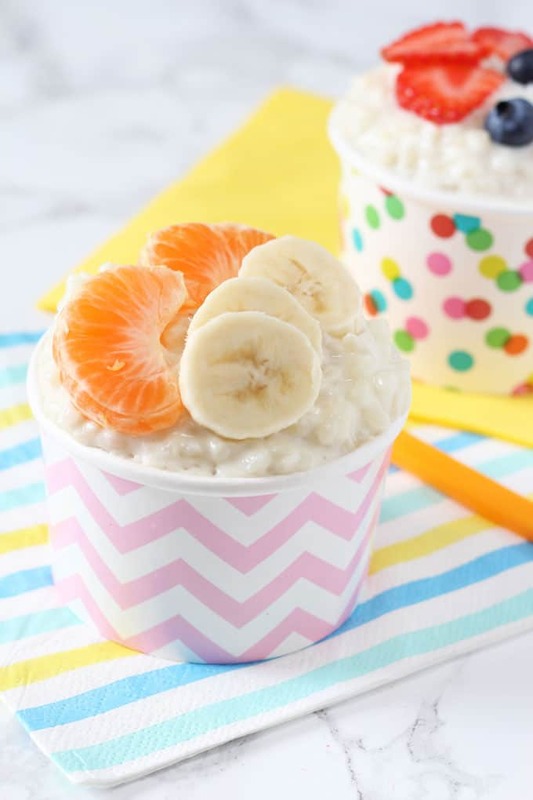 A delicious sugar free rice pudding recipe, naturally sweetened with coconut and great for weaning babies and children! As promised I am starting to share more of my favourite baby friendly recipes here on the blog (did you catch my first recipe? 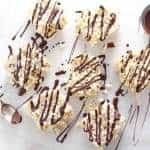 These Sugar Free Flapjacks for Baby Led Weaning.) Weaning can difficult at the best of times. But continuously coming up with new and varied recipes that are healthy and nutritious is such a battle, particularly when you have other children to feed too. My tactics for weaning my second child pretty much revolved around trying to feed him as much food as possible that my daughter already ate. This meant that I wasn’t spending hours in the kitchen every day cooking up several different variations of breakfast, lunch and dinner for the whole family. From the beginning one of my son’s favourite desserts has been this Coconut Rice Pudding. I used to make a version with honey for my daughter but decided to try a completely sugar and honey free version when my son was about 7 months old. The coconut milk and desiccated coconut naturally sweeten the rice so there really is no need for sugar or any other sweeteners. Although the rice is completely soft when cooked, if your baby prefers their food very puréed then simply blitz it in a blender or food processor after cooking. 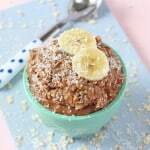 This recipe makes between 4 and 6 portions, depending on the age of your baby or child. It can be stored in a container in the fridge for up to 2 days. Just be sure to allow it to cool completely before putting it in the fridge. It can also be frozen in individual portion and defrosted at room temperature. The rice pudding is delicious served on it’s own but also tastes great with fruit compote, sugar free jam or chopped fruit. I have to admit to actually giving this to my little boy for breakfast on several occasions as I know he just loves it! Place all the ingredients in a heavy bottomed sauce. Bring to the boil then reduce to a simmer. Cover with a lid and allow the rice to simmer for 30 minutes or until all the milk has been absorbed and the rice is soft, stirring every few minutes. Serve with fruit compote, sugar free jam, chopped fruit or any other toppings. This recipe makes between 4 and 6 servings, depending on the age of your child. 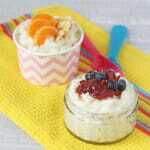 The rice pudding can be frozen in individual containers. To defrost, leave out to defrost at room temperature and reheat gently in a saucepan or in the microwave, adding a little milk if needed. My kids really like having a “pudding” after dinner and I really struggle to keep coming up with dessert ideas that aren’t completely sugar laden so this recipe has been a godsend. We add different fruits and toppings to it to keep it varied and they love it. Hello, do you know if I could use brown rice instead of pudding rice? Thanks! Im not sure that would work. I have only ever used pudding rice. Hi,I was wondering how can i make this sugar free coconut rice pudding recipe for two people that want a full small bowl each? Hi Kim, just halve the ingredients if you just want two small portions. 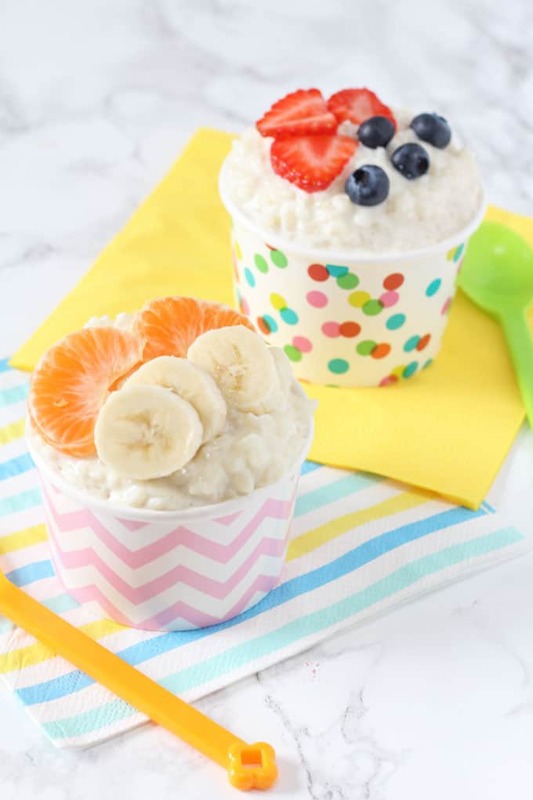 Hi,how are you doing?I just copied your coconut rice pudding recipe for fussy eaters.I am not a fussy eater and my mom also isn’t a fussy eater but my niece and nephew sure are fussy eating like their dad who is my brother. 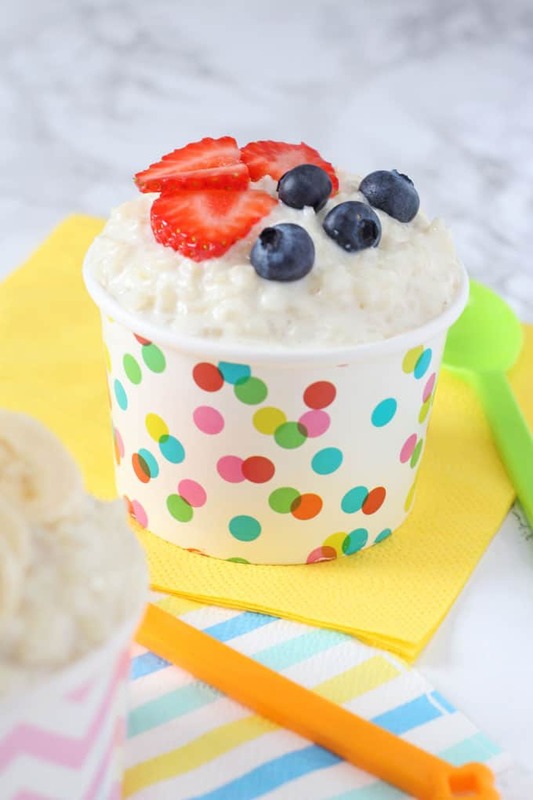 I am going to make your rice pudding soon,and this recipe seems OK for me to eat because I am a diabetic and it doesn’t have any sugar in it. 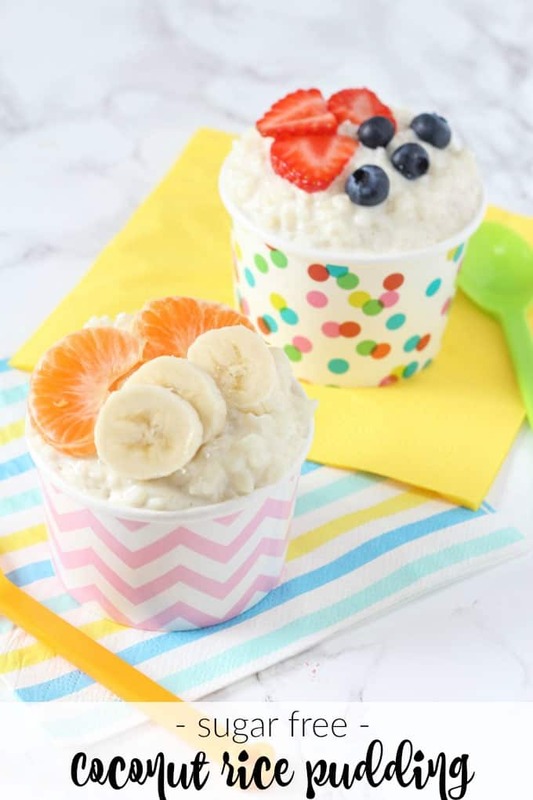 Can I use light coconut milk,lactose free milk ,almond milk in your recipe?my mom and I are the only ones that will eat this coconut rice pudding,we can’t get the kids into trying new foods. Hi Kim, you can pretty much use any milk you like in this recipe. The coconut milk does give it a lovely taste though. I use the stuff in a carton (like regular drinking milk) rather than the can so it’s quite light anyway. do you think I can use only coconut milk? We are kind of no cow milk and cannot get other milk sub’s. thanks! Hi Nihal, yes you can! My very fussy one year old loves this. Thank you for the fab reciepe. This would be great for breakfast!!! I live off chai lattes. 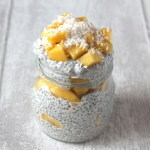 Wonderful healthy recipe!! Thanks for the post. Can I replace full fat mik with formula milk? Hi Kathy, I haven’t tried it formula. I’m not entirely sure if it would work the same given that you have to cook it for so long. But its certainly worth trying! Let me know how it goes. That’s great to know, thank you for sharing! We do not drink dairy milk in our house…do you know if almond milk would work in the same proportions? I can’t wait to try it! Hello, yes I’m sure the same portion of almond milk should be fine! Lol!!! Hope you managed to get the baby to bed!! Hi Megan, pudding rice is a specific type of rice we have in the UK which we use to make rice pudding. But you can use normal long grain rice too. Can I join your child in liking this recipe? Ha ha! I have to admit its pretty tasty for adults too! Beautiful! Definitely going to give Roo a try of this!